Vada pav is a popular snack from Maharashtra-India but popular all over. Vada popularly known as batata vada means a fried ball (patty) made of potato (batata). Pav is an Indian baked bread but not sweet as bun. 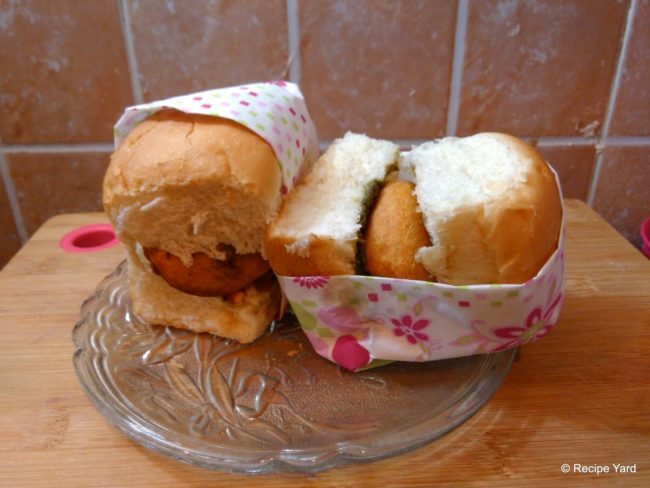 Vada pav may also be called the Indian version of a burger. Take gram flour in a bowl and add carom seeds, baking soda, ½ teaspoon red chili powder and salt to taste. Mix all and make a thick batter adding enough water to make it of consistency so that the batter sticks to potato balls when soaked in it. Be sure that lumps are not made. Keep the batter aside for a while. Now put a pan on medium heat and add 1 tablespoon oil. When the oil is heated, add mustard seeds and ½ teaspoon cumin seeds. Also add curry leaves once the mustard seeds start cracking. Add the grated ginger and let it stay until cooked well. Then add a pinch of asafoetida, chopped green chili, ½ teaspoon red chili powder and ¼ teaspoon turmeric simultaneously. Now add the mashed potatoes and salt to taste. Cook for 5 minutes mixing all ingredients of the pan and keep aside to cool. Now put another pan on medium-low heat and dry roast 1 teaspoon cumin seeds and the whole dry red chili. Add a pinch of asafoetida and the peanuts to it. Now shift the mix to the grinder. Add ¼ teaspoon turmeric powder, dry mango powder and salt to taste and grind to a fine powder. Dry peanut chutney is ready. Shift it to a bowl. Now put a deep frying pan on medium heat with oil in it. Make small balls of potato mixture, dip them in the gram flour batter, and carefully drop them into oil. Fry until golden brown, rolling over from all sides. Drain them out on a plate lined with paper towels for removing excessive oil. Cut the pav horizontally into half in such a way that they remain joined from one side. Spread the dry peanut chutney on downside of the pav and spread green coriander chutney on the upper side of it, place the vada in between. Lightly close the pav and press it gently. Wrap in a tissue paper and serve hot.